Indian food is rich with a variety of nourishing spices. 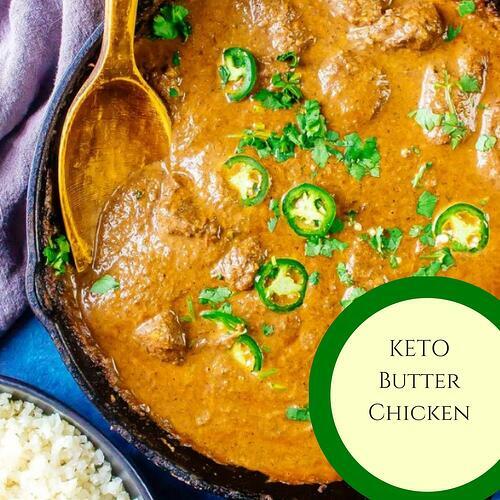 This fast and easy Butter Chicken is a popular recipe for those on a keto diet. 1. Cut chicken into 2-inch pieces and place in a large bowl with 2 tablespoons garam masala, 1 teaspoon grated ginger, and 1 teaspoon minced garlic. Add in the yogurt, stir to combine. Chill at least 30 minutes. 2. For the sauce, place the onion, ginger, garlic, crushed tomatoes and spices in a blender, and blend until smooth. Set aside. 3. Heat 1 tablespoon of oil in a large skillet over medium high heat. Place the chicken in the skillet, browning 3 to 4 minutes per side. Once browned pour in the sauce cook 5 to 6 minutes longer. 4. Stir in the heavy cream and ghee, continue to cook another minute. Top with cilantro and serve with cauliflower rice if desired.